Proposals for papers and for visual and performing art are welcome for the three day interdisciplinary conference Objects in Motion: Material Culture in Transition. 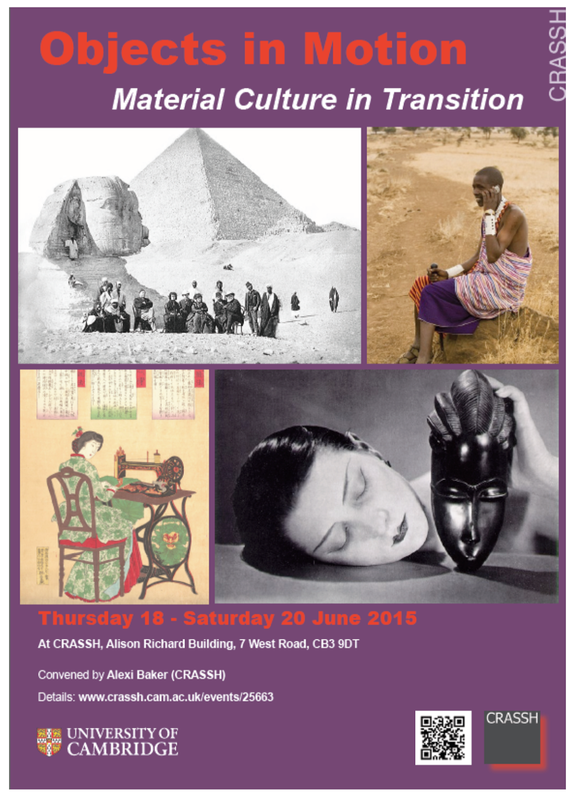 The conference is supported by and will be held at the Centre for the Arts, Social Sciences and Humanities (CRASSH) at the University of Cambridge on 18-29 June 2015. The deadline for proposals is 15 March 2015, and registration is expected to open in April 2015. Objects in motion will bring together diverse scholars, curators, writer and artists to discuss material culture in transition. Material objects are produced within specific contexts - geographical, cultural and temporal. This is true for things as diverse as the Great Sphinx built in Egypt at least 4500 years ago, the Lindisfarne Gospels illuminated in 8th century Northumbria, a wooden ceremonial mask carved in 19th century Nigeria, or a mobile phone made in 21st century China. What happens when objects such as these transition into other contexts? How are differences in use and meaning negotiated? Sometimes later reinterpretations and reincarnations (including 'fakes' and reproductions) incorporate elements of the objects original use and meaning, and other times they diverge entirely. This can affect not only themselves but also the knowledge and experiences embedded within or produced by them - as with books, musical recordings, and technologies. Scholars, curators, writers, and artists from all disciplines are welcome to propose relevant talks. Visual artists (including photographers) are also welcome to propose artwork on the theme to be displayed in the Alison Richard Building. Proposals for performing arts may be made as well, within the constraints of space and time stated below. The papers and art, selected by both CFP and invitation, will be complemented by events at local museums. These diverse contributions will help to shed light on material culture dynamics which remain highly relevant even today despite the growth of multinational corporations, global communications, and increasing standardisation. They will also foster,productive dialogue on different disciplinary and interdisciplinary approaches to studying and responding to these dynamics. 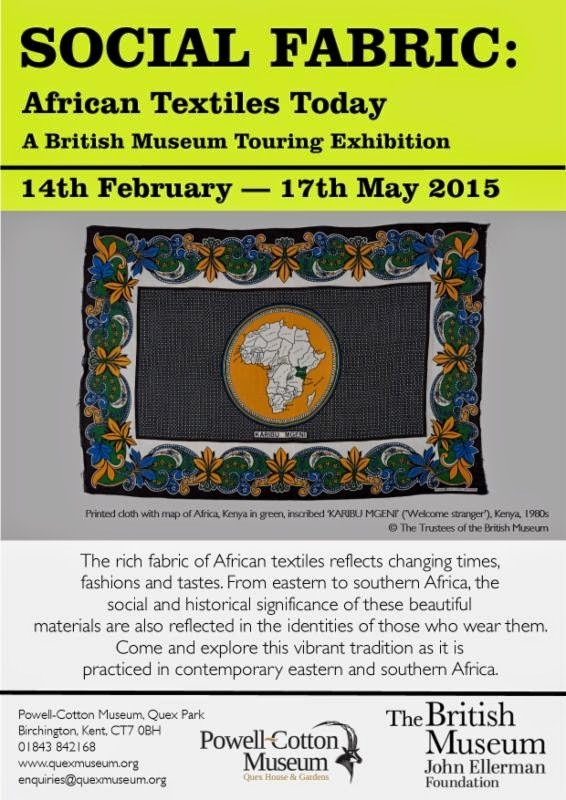 Proposals for talks should be emailed to the convenor Dr. Alexi Baker by 15 March 2015. They should include a title, an abstract of up to 250 words, a brief biography, contact information, and any institutional affiliations. Scholars at all stages of their careers including independent scholars are encouraged to apply, as are artists and writers who would like to offer talks reflecting on the conference theme. Proposals for visual or performing arts which reflect upon the conference theme should be emailed to the convenor Dr. Alexi Baker by 15 March 2015. The visual artwork will hang in the ground floor seminar rooms of the Alison Richard Building from the time of the conference until at least October 2015, and must be fitted to the available space and hanging facilities. The artist(s) must be able to transport their works to the Alison Richard Building themselves and to install them with limited assistance from staff. Each piece will need to come fitted with string or hooks on the back so that they can be attached to the hanging rails in the seminar rooms with nylon string. (the type of rails in use can be seen here). Small labels may also be affixed near the artworks using white-tack. Proposals for performing arts will be considered as well as long as they can be staged within the limited space f a seminar room, and have a running time of less then one hour. Possibilities could include for example recitations, musical performances, or self-contained dramatic performances. The theme is Contemporary Collecting, and it will take place at Brighton Museum on Monday 2nd March. The day is free of charge to SSN members and includes lunch. - new approaches to displaying archaeology. An essential conference for anyone working with archaeology collections or on archaeology projects. This event is in association with the Portable Antiquities Scheme and the Council for British Archaeology. The Herrenhausen Symposium "Museum of Cultures, Wereldmuseum, Världskulturmuseet,... What Else? Positioning Ethnological Museums in the 21st Century"
The Herrenhausen Symposium "Museum of Cultures, Wereldmuseum, Världskulturmuseet,... What Else? Positioning Ethnological Museums in the 21st Century" by the Volkswagen Foundation in cooperation with Deutscher Museumsbund discusses the need for a critical appraisal of the past, present, and future of ethnological museums. The symposium which will take place from June 21-23, 2015 in Hanover, Germany is looking early career researchers to participate. Rooted in the curiosity cabinets of the Enlightenment, ethnological museums experienced an enormous boom during the colonial period. The collections assembled in those past times continue to characterize the exhibits of ethnological museums today, causing the need for a critical appraisal of the past, present, and future of this particular genre of museum. The symposium will address topics like the history of museum collections, provenance research, the special case of "restitution", different forms of cooperation as well as how these aspects can become part of ethnographic exhibitions. The Volkswagen Foundation offers 15 Travel Grants for young researchers who wish to attend the symposium. The deadline for application is March 15, 2015. For more information on the application process, please visit the website. slope, a 1970s Fijian barkcloth hung at the back, which was one of the last gifts Barbara’s father hunted down for her in a bargain sale, a while ago now. The other item in the case is a beautiful modern reconstruction of the tapa waistcoat that Mrs Cook made for her husband, but never finished. 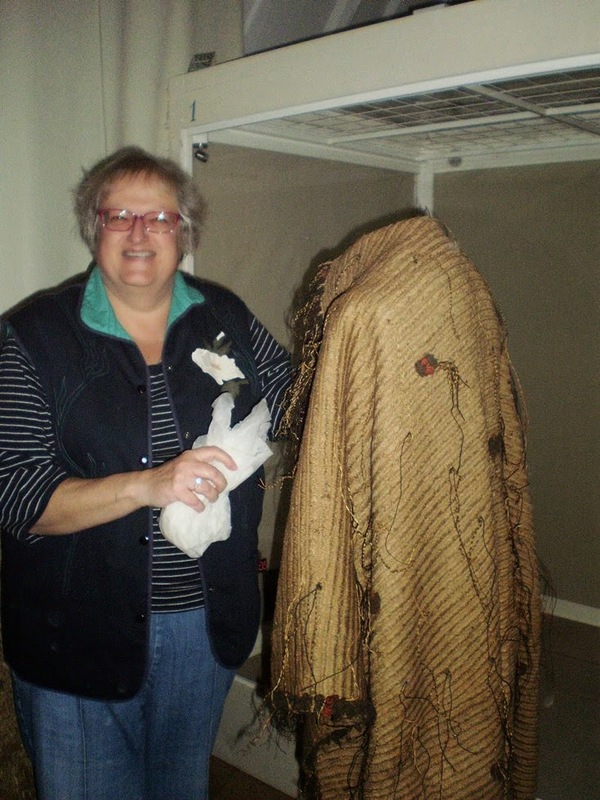 The partial garment, Cook died before it was finished, survives in Australia. This new waistcoat is by Alison Larkin. It has a linen back which laces up the centre, and fine silk floral embroidery enhanced with tiny silver coloured sequins or spangels. There are real pockets under the flaps. 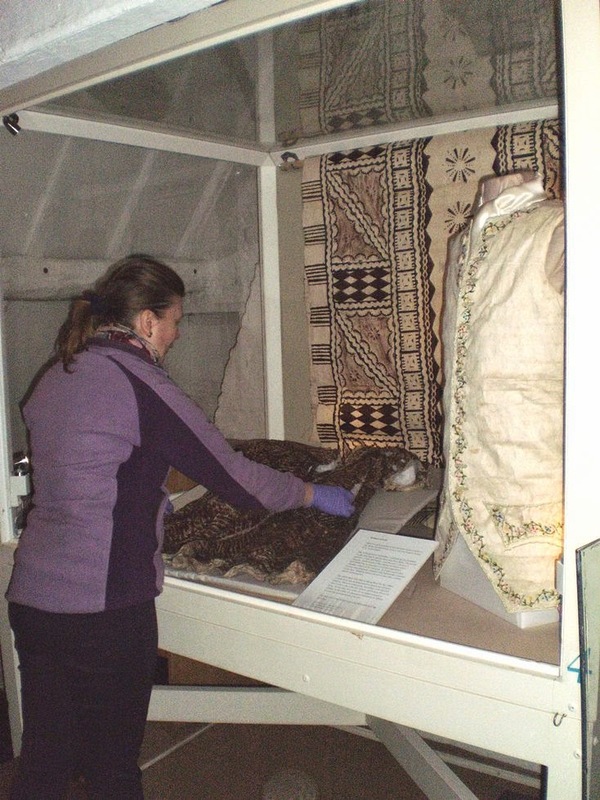 We stayed to help with the install of a stunning tapa poncho cloth from Kew, and to watch the others installing two Maori flax cloaks on loan from the Great North Museum. 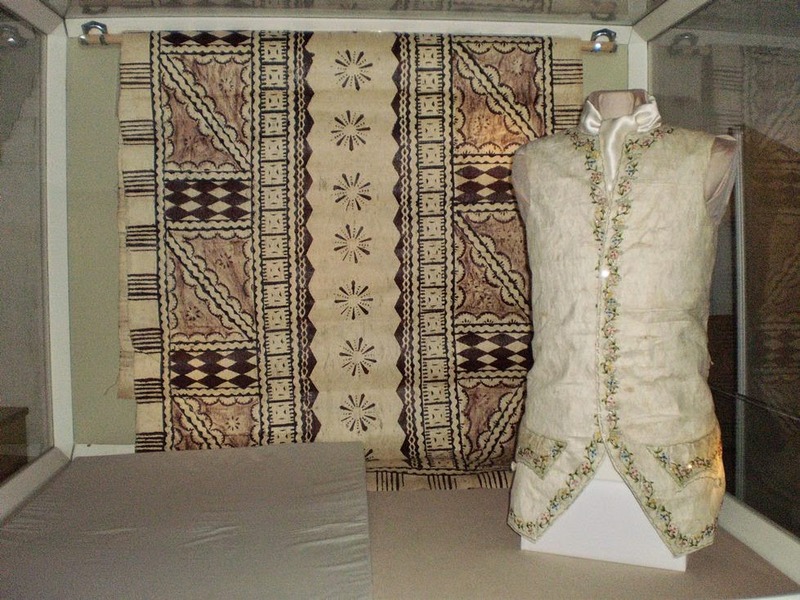 The Leeds Samoan girl’s dress is made from tapa coloured with traditional designs, and tailored with a yoke, collar and sleeves and buttons down the front. It may have been made for an indigenous girl, or perhaps for the child of a European missionary or official. It is rare for such dresses to survive. A good photograph of it can be found on the exhibition page of the Cook museum. 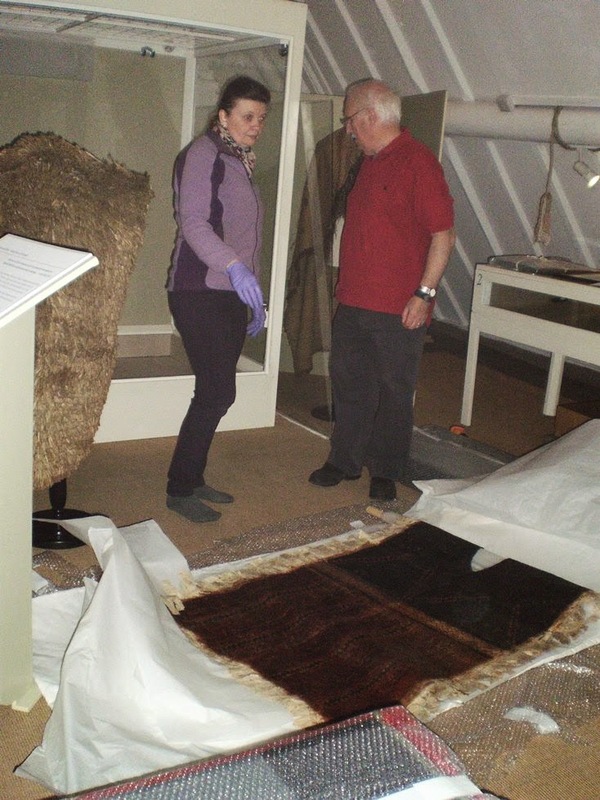 The dress was transferred to Leeds Museums in 1964 from Leeds Corporation Works Department. The notes say: Formerly in the house of Mrs Bell, cleared by Corporation Housing Department. Items brought to the museum by Mr Fitzgerald of Housing Dept. The material seems to have been brought home by E.R.G. Bell (husband or father in law?) and includes a sketch map of Samoa and its islands. I’ve tried to trace ERG Bell, but no success so far. 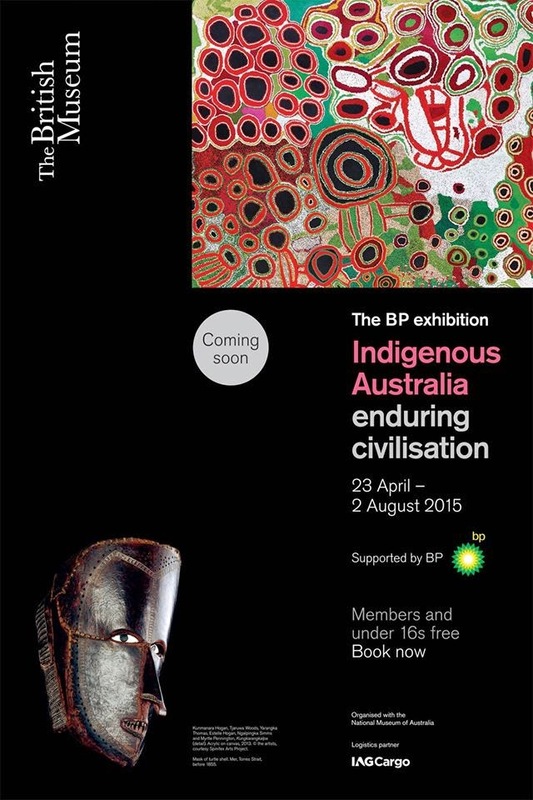 The exhibition opens this Saturday, 14 February and will run until the Captain Cook Memorial Museum closes for the winter at the end of November. The workshop will be held at the University of Wolverhampton, Wolverhampton city Campus. To submit a proposal, please send title and abstract of c.300 to 400 words to Laura Ugolini, at l.ugolini@wlv.ac.uk by 6 March 2015. Individual papers are usually 20 minutes in length, followed by 10 minutes for questions and discussion. We also welcome shorter, 10 minute presentations, which might focus on a specific collection, new project or work in progress. If you are unsure whether to submit a proposal, please e-mail Laura Ugolini at l.ugolini@wlv.ac.uk to discuss your ideas. The Amis are the largest indigenous tribe in Taiwan with a population close to 182,000, mainly live along the east coast of the island. The Amis are the only remaining matriarchal aboriginal tribe in Taiwan who create earthenware using traditional methods. The exhibition looks into the Amis lifestyle, women’s role in earthenware production, the ceremonial aspect of this ceramic tradition and the production process. There will be photos and examples of Amis earthenware along the staircase, and a 10-minute documentary film on the second floor.